Welcome to Domain des Caminottes, La Roche Saint Secret in Provence. We are in a former silk factory that was operational until 1886, when a fire destroyed two thirds of the building and led to the closing of the factory. In 1906, the property was purchased by our grandfather Isidore CHASTAN. He undertook the reconstruction of the central part of the factory and diversified agricultural activity with the planting of fruit trees, truffle oaks and vines. The semi-underground vault allowed him to make wine which he sold in restaurants in the local area until the 1950s. 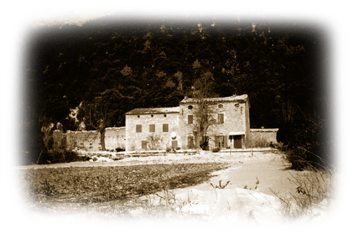 From 1950 to 1980 the main activity focused on sheep farming, the production of firewood and harvesting of truffles. By 1980, Christian and Roselyne GOURJON had taken over the homestead and replanted fruit trees and new vines. The grapes were sold to a co-operative cellar for wine production.